This week, three drivers (red, yellow, and blue) are racing to the pub for a shot of Absinthe and the last pickled herring. Red driver (a novice) has taken to approaching corners as fast as possible by braking late and trying to go as fast as possible through the corner. The red driving line follows a curve with a smooth arc and a large radius that help to keep traction even though speed is high. Red driver resumes accelerating at point A, once it’s clear that he or she will stay on the road and miss that last large tree. Yellow driver starts to turn in very early in an effort to go in fastest of all, braking while turning slightly taking the (near) straight line of deceleration go for as long as possible. Once yellow driver has also stablished that he or she wont hit the last tree, full acceleration can resume at B. Blue driver gets the braking done earlier than the other two drivers, turns in sharply, and can accelerate out of the corner starting at C, far earlier than the others. The correct line will see the car carried completely out to the outside curb by the acceleration and gently unwinding the wheel. At first, it seems like the wrong approach to fall sharply behind red and yellow at the beginning of the turn, but if the straightaway after the curve is long enough, the earlier acceleration and faster exit speed from the corner will more than make up for the initial setback. 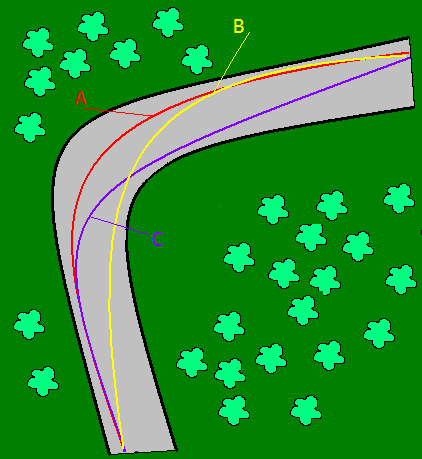 To be sure, there are corner geometries where trail-braking (yellow) is the right technique. This simple curve is not really one of them as long as the following straight is long enough and there are no other nearby curves to complicate matters. Drivers red and yellow react to falling behind blue driver by trying to go into the corners faster and faster. Going into the corner faster and braking later and harder than ever puts them ever more at risk of a catastrophe at the final tree and the knuckles start to whiten. Each driver is at great risk to unforseen problems like a bump or bit of debris that reduces braking performance. However, this approach is tempting in that it feels like the exactly the right thing. Becoming more technically proficient at threshold braking, getting better at split second brake application, and getting all cramped behind the wheel feels like racing! In contrast, blue driver has much more safety margin in the turn. No white knuckles, no sweat stained shirts. Perhaps the champagne glass on the central console develops a standing wave, but nothing serious. If this driver misses a braking point and goes in a little hot, there’s some buffer room. A little time may be lost in this case, but not the car. 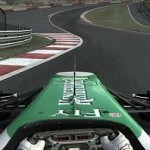 This approach looks deceptively slow and simple and it has the advantage of being easier on the car and the driver over longer races; even the simulated versions. No wonder the insurance companies have given up on the place. Normally, I would learn the line for myself, but in the face of oncoming deer I’m willing to cut a few corners. I keep a copy of this document in a binder to look up the right approach if I start to drift from the preferred line. Long radius corners and corners where you can’t see the exit (or even the road surface) are very difficult and require lots of practice and patience to get right and keep doing right. When a passage that previously was easy now seems fiendish, I review the line and/or some earlier replays and more often than not a single correction is all that’s required. This week’s time is down to a more respectable 7:21.523. At this point I’d say I have a pretty good notion of the sequence of corners but not necessarily the best sequence through them all. That video is great. Tell me, Helmut, to what degree is the racing wheel/other accoutrements necessary for true enjoyment of a racing game? It seems to me that such equipment would be almost imperative. Do you agree? If so, does this mean that serious racing will become more and more niche, like giant-mech games that call for throttles and foot pedals and so on? What’s the barrier for entry? I myself can’t stop hitting the walls when I play the Gran Turismos of the world using thumbsticks. The peripheral market is going through the same change as the PC game market itself, which is no great surprise. There are so few games that require a joystick in any meaningful way and there are few low to mid-range joysticks/wheels to buy. The peripheral shelf in any computer store will carry far more console peripherals than PC ones. I have this wheel setup: http://www.logitech.com/index.cfm/gaming/playstation_3/devices/131&cl=US,EN It is overkill, but I’ve had problems with ‘noise’ in cheaper devices over time which can be quite frustrating. Admittedly, a good deal of time. 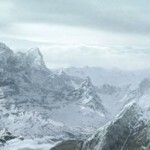 The force-feedback in conjunction with a realistic (ish) physics model is astounding. Via the feedback to the wheel you can feel the limit of traction, the release as you exceed the friction available to the tires, and the inevitable crush and ripping metal feel as you pile into the trees. You can feel the car go weightless over the bumps as the resistance to turning pressure drops then resumes on landing. There is no seat of the pants feedback in these games (barring one of those hydraulic rigs) and the force-feedback is the only tactile input you have regarding the state of the connection between your car and the road. That video was from a Richard Burn’s Rally and in that game I find my steering wheel to be counterproductive. It is such a frantic game with a few more absolutely necessary inputs (eg. handbrake) than I have buttons suitable for use. I find playing with a joystick actually simplifies things. So depending on the game I wouldn’t say an advanced device is necessary or even helpful. I’d guess the keypad you’re using has the disadvantage of digital input on the keypad and very twitchy input on the analog sticks making driving quite tricky. Is this on the PS3? Does it support external joysticks? That might be something you could try. Sorry, I’m not mailing you mine. I would be cautious about eBay for these devices as buying someones noisy wheel is going to be a souring experience.